Thomas Mapfumo, the Lion of Zimbabwe, stands beside Fela Kuti, Youssou N’Dour and Franco as one of Africa’s greatest and most consequential composer/bandleaders. For over 40 years, he has merged ancient African traditions—especially that of the sacred, metal-pronged Shona mbira—into the currents of international music, from rock to reggae to rap. Mapfumo’s artfully barbed lyrics have targeted the racist regime of Ian Smith and the corrupt one of Robert Mugabe with equal resolve and courage. 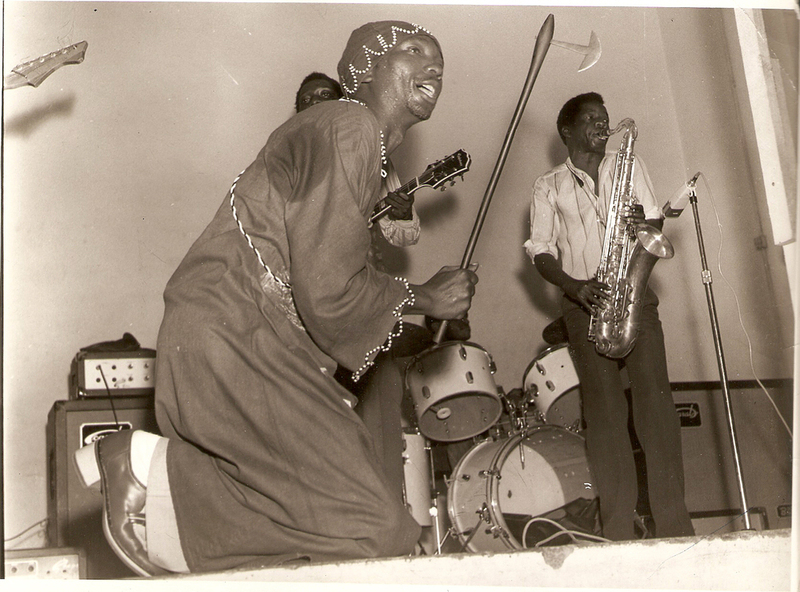 That’s the essence of chimurenga—the music of struggle: past, present and future. All copies purchased from this site come signed by the author, and with his deep thanks! A deep, detailed biography of a complex African musician and the homeland that has shaped his artistry. Mapfumo Speaks: "Dying For Politics"
Mapfumo Speaks: "Light At The End Of The Tunnel"
Mapfumo Speaks: "A Good President"
Lion Songs: Essential Tracks in the Making of Zimbabwe is superb anthology that follows the life and musical path of celebrated Zimbabwean singer-songwriter and Thomas Mapfumo. It’s also the companion CD to the book Thomas Mapfumo and the Music That Made Zimbabwe (Duke University Press) by Banning Eyre. 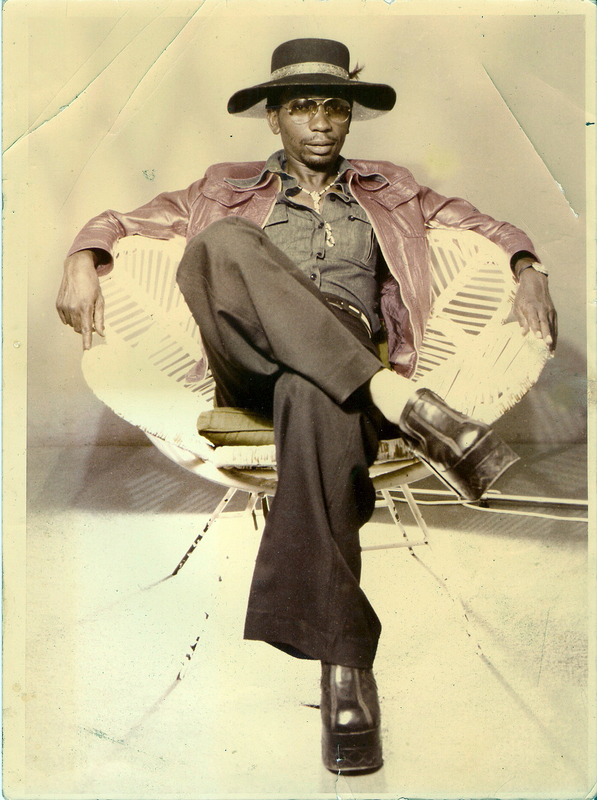 Thomas Mapfumo is an essential figure in Zimbabwean music. His politically-committed lyrics (even though he also writes songs about soccer and other passions) got him in trouble numerous times and he went into exile in 2004. Musically, his various bands have been a school for numerous musicians as Mapfumo mixed traditional music from Zimbabwe with rock, reggae and other styles. 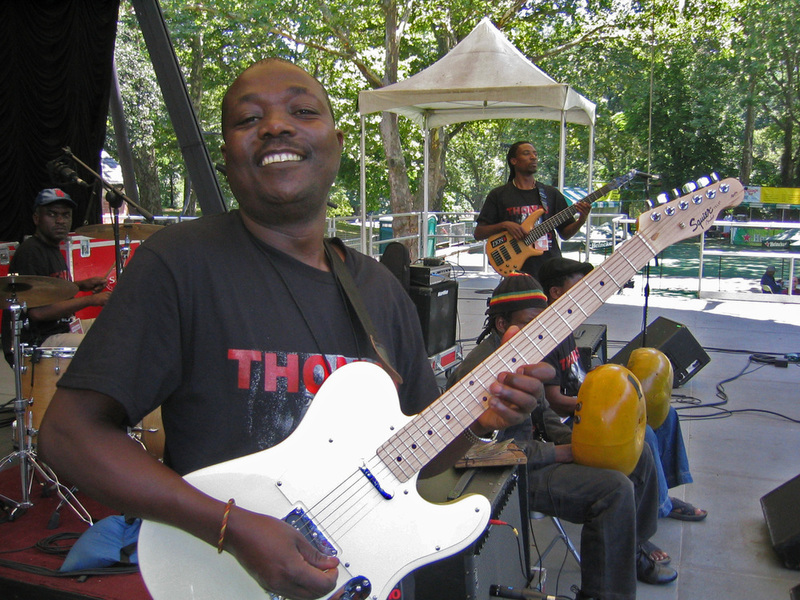 American freelance writer, guitarist and radio commentator Banning Eyre has specialized in African music for many years. He’s worked as a producer for the syndicated radio show Afropop Worldwide and is a contributor to National Public Radio’s All Things Considered (although it seems like NPR has reduced its musical diversity lately). Eyre first met Mapfumo in 1988. 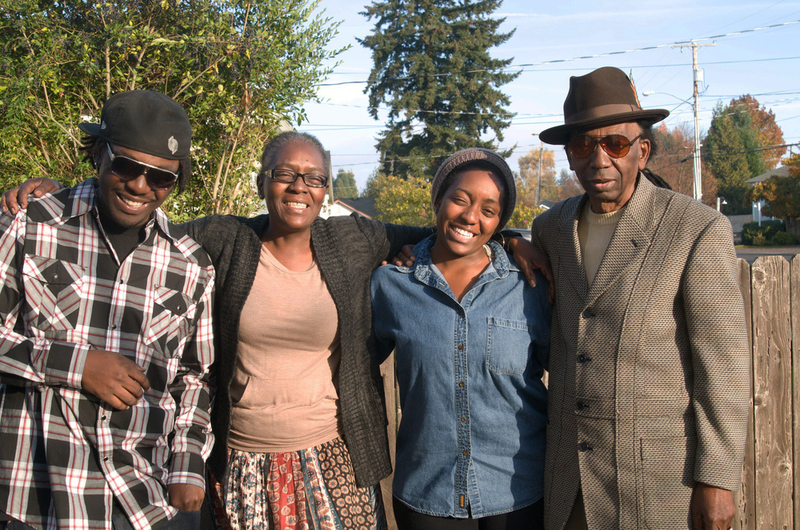 Since then, he has developed a 27-year friendship with the Mapfumo, his family and musicians. Thomas Mapfumo’s musical style is known as chimurenga. Lion Songs: Essential Tracks in the Making of Zimbabwe gives you a detailed overview of Thomas Mapfumo’s entire career featuring recordings made between 1973 and 2010. As far as highlights, I’m more interested in the latter part of his career, where he added an irresistible dance groove based on the hypnotic sound of two mbiras (a lamellophone also known as thumb piano). You’ll find several great examples of this sound on the album. Lion Songs: Essential Tracks in the Making of Zimbabwe also includes excerpts of interviews, with Mapfumo describing key moments of his music. There is nothing like a concert by Thomas Mapfumo and the Blacks Unlimited at home in Zimbabwe. The music is mesmerizing and ecstatic, and the crowd simply can’t get enough. The band would start around 8:30 p.m. and rarely wind up before 3:30 in the morning. Fans would flock and stay all night, dancing the band’s deep grooves and meditating on Mapfumo’s voice booming with ancient wisdom and street-smart moral authority. From the mid-1970s up until Mapfumo went into exile in 2004, this experience was a major feature of life for many Zimbabweans. The Mapfumo experience also lies at the heart of this African nation’s remarkable and troubled history. This album is the audio companion to the book Lion Songs: Thomas Mapfumo and the Music That Made Zimbabwe (Duke University Press; album release: May 5, 2015) by Banning Eyre, a deep exploration of music and history and a compelling read. Eyre first visited Zimbabwe and met Mapfumo in 1988. Since then, he has enjoyed a 27-year friendship with the artist, his family and musicians. Eyre has performed on guitar and played on Mapfumo recordings, and become deeply familiar with the inner workings of Mapfumo’s band, the Blacks Unlimited. 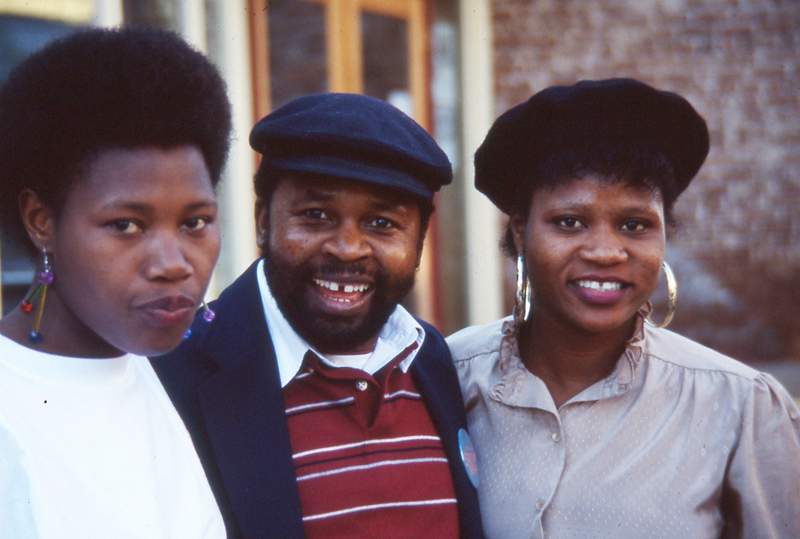 Eyre has visited Zimbabwe four times, including a six-month stay in 1997-98, during which he moved through the country with the band, attending and participating in some 75 shows. Eyre got to know Mapfumo’s fans informally. He also conducted interviews with musicians, band members, Mapfumo family members, DJs, writers, journalists, and of course, the man himself, many times and in many locations and circumstances. All this and a great deal of archive and book research go into Lion Songs, an absolutely unique work in the literature of African music. 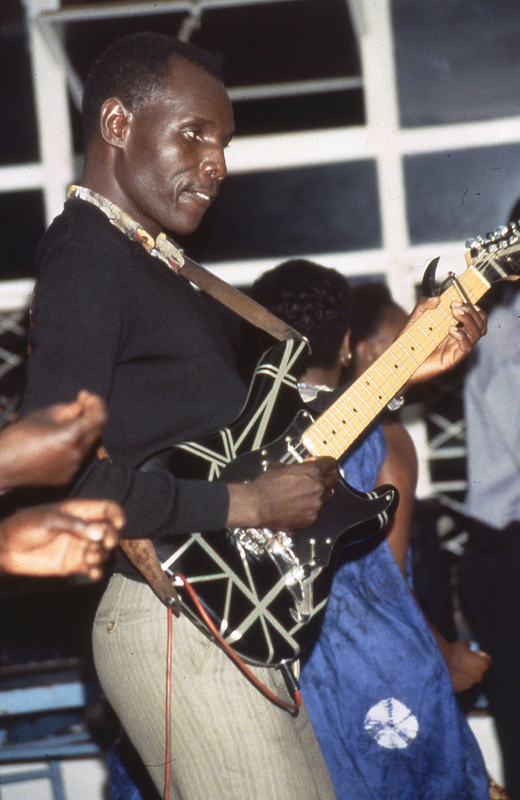 But as the book was completed, Eyre considered Mapfumo’s large catalog of recordings and saw a problem. The albums and singles cover a span of over 40 years. Some are out of print or hard to find. Some were never released outside Zimbabwe. There are useful compilations, but each focuses on a particular period. Not one conveys the entire sweep of Mapfumo’s creative evolution, capturing the energy of the early guitar-based experimentation, notably the groundbreaking guitar innovations of Jonah Sithole, Joshua Dube, Ephraim Karimaura and others, then the richness of the large band—featuring three mbiras, two guitars and a brass section—in the late ‘80s and early ‘90s, also the energy of a live Mapfumo show, and the complex recordings the maestro has created during his decade-long exile in Oregon. An album that captures all of that was needed, so Eyre decided to make it. The Lion Songs CD is unusual in another way. In the spirit of Bob Marley’s Talking Blues album, Eyre decided to include short excerpts from interviews with Mapfumo over the years. These clips both dramatize Mapfumo’s political and creative journey, and give an insight into his personality, passion and humor in a way nothing else can. 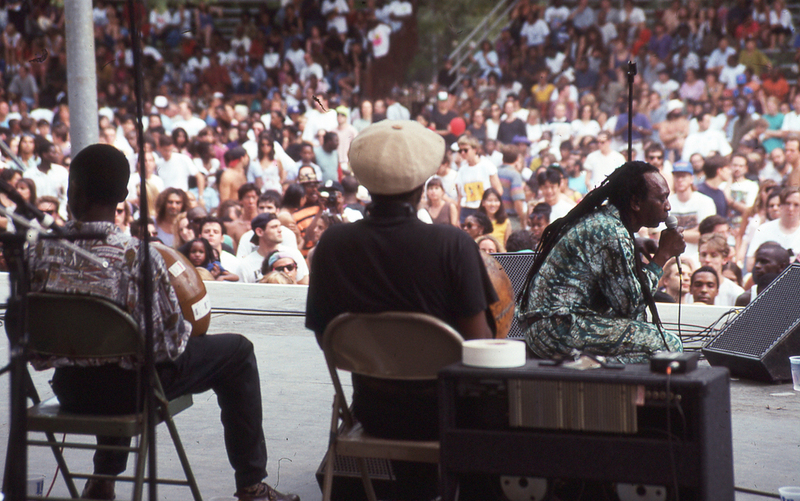 Mapfumo’s deeply resonant voice is, in its way, as musical as the songs themselves. The 14 songs in this collection were recorded between 1973 and 2010. The set begins with “Ngoma Yarira,” one of the first truly successful popular adaptations of Shona mbira music. The song was a hit for the Hallelujah Chicken Run band, and a crucial turning point for Mapfumo’s art. The album continues with a number of “chimurenga singles,” war-era songs that helped to stiffen the resolve of the guerrilla fighters in the bush. These include the original 1977 Acid Band version of “Pamuromo Chete (It’s Only Talk),” a piquant retort to Rhodesia’s final prime minister, Ian Smith, who wrongly predicted the longevity of white rule. This track has never before been released internationally. 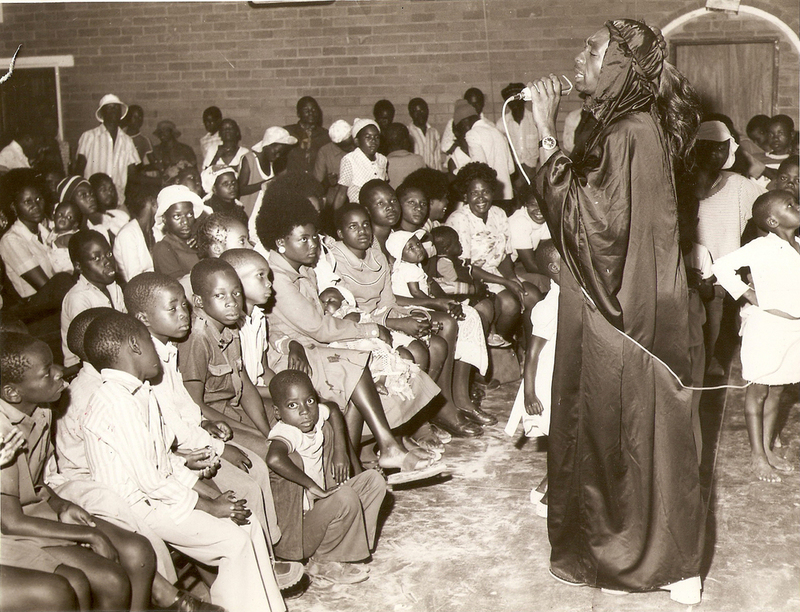 The 1980s was an extremely fertile period for Mapfumo and the Blacks Unlimited, yielding songs that giddily celebrate Zimbabwe’s independence, as well as foreboding warnings of danger to the young nation, and ultimately an outright condemnation of the Mugabe regime in the 1989 classic, “Corruption.” Blacks Unlimited songs from the ‘90s showcase the mbira-enhanced band, and stress Mapfumo’s insistence that his fellow citizens not abandon their ancestral culture, but rather find ways to integrate it into their contemporary lives. ESSENTIAL Tracks in the Making of Zimbabwe is superb anthology that follows the life and musical path of celebrated singer-songwriter and Thomas Mapfumo. It’s also the companion CD to the book ‘Thomas Mapfumo and the Music That Made Zimbabwe’ (Duke University Press) by Banning Eyre. 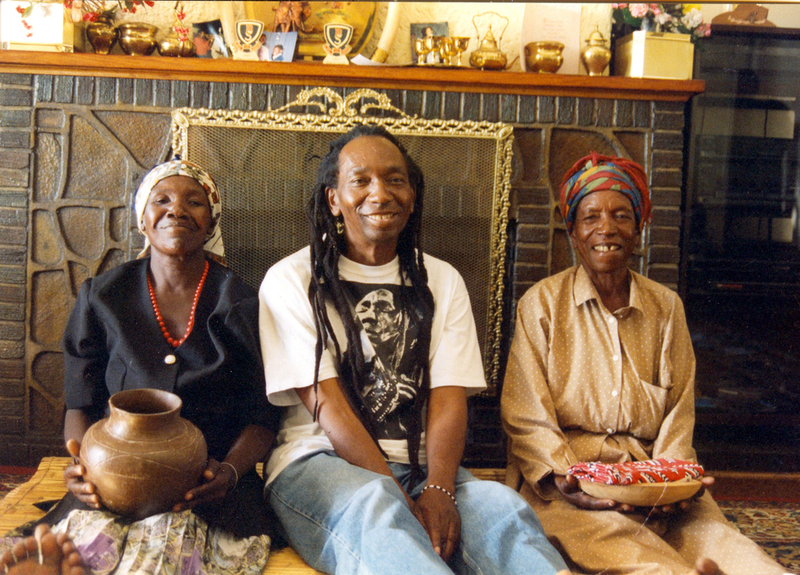 Thomas Mapfumo is an essential figure in Zimbabwean music. His politically-committed lyrics (even though he also writes songs about soccer and other passions) got him in trouble numerous times and he went into exile in 2004. Musically, his various bands have been a school for numerous musicians as Mapfumo mixed traditional Zimbabwean music with rock, reggae and other styles. American freelance writer, guitarist and radio commentator Banning Eyre has specialized in African music for many years. He’s worked as a producer for the syndicated radio show Afropop Worldwide and is a contributor to National Public Radio’s All Things Considered (although it seems like NPR has reduced its musical diversity lately). 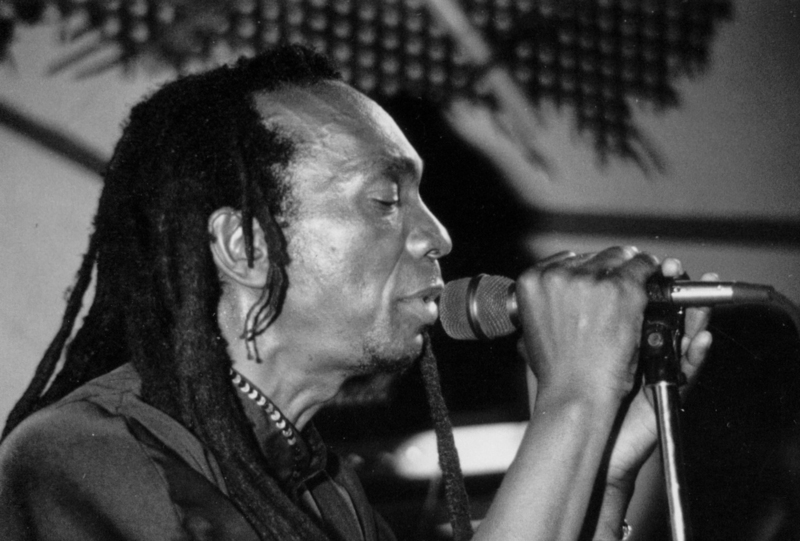 Eyre first met Mapfumo in 1988. Since then, he has developed a 27-year friendship with Mapfumo, his family and musicians. Lion Songs: Essential Tracks in the Making of Zimbabwe gives you a detailed overview of Thomas Mapfumo’s entire career featuring recordings made between 1973 and 2010. As for highlights, I’m more interested in the latter part of his career, where he added an irresistible dance groove based on the hypnotic sound of two mbiras. You’ll find several great examples of this sound on the album. Lion Songs also includes excerpts of interviews with Mapfumo describing key moments of his music. New album collates Thomas Mapfumo’s crucial chimurenga music career through the songs that made Zimbabwe. It is rare that African literature and music are simultaneously blessed with canonical works derived from and celebrating the art of a living legend. This, among other things, is what makes Banning Eyre’s riveting book Lion Songs: Thomas Mapfumo and the Music that Made Zimbabwe and it’s revelatory accompanying audio compilation Lion Songs: Essential Tracks in the Making of Zimbabwe particularly extraordinary. For forty years Thomas Mapfumo’s voice has reverberated resilient and steady; resonating the struggle to liberate the people of Zimbabwe, expressing jubilation at a new political dispensation and later revealing the painful disappointment of a dream deferred. Affectionately known as the Lion of Zimbabwe, Mapfumo stands beside Fela Kuti, Youssou N’Dour and Franco as one of Africa’s greatest and most consequential composer/bandleaders. Expertly weaving ancient African traditions-especially that of the sacred, metal-pronged Shona mbira- into the currents of international music, from rock to reggae to rap, Mapfumo’s artfully barbed lyrics have targeted the racist regime of Ian Smith and the corrupt one of Robert Mugabe with equal resolve and courage. That’s the essence of chimurenga-the music of the struggle: past, present and future. Pegged for release on the 5th of May the album condenses his illustrious career into a 14-track set, complete with rare gems and peppered with snippets of interviews conducted by Banning Eyre. Not to be confused with greatest hits the album, along with Eyre’s book, is the zenith of a thirty-year friendship between the two, which saw the former documenting, researching and participating in Mapfumo’s art. For the die-hard Mapfumo fan, songs like Corruption reach back to a time when his music was the staple of national radio playlists and the anticipation of his electric annual festive season concerts were a firm feature in Zimbabwe’s cultural psyche. Mapfumo, who has not lived in the country since 2001, recorded two of the songs, Marima Nzara and Ndangariro, in exile. For the uninitiated, extracts from Eyre’s interviews with Mapfumo, over 30 years, provide context both dramatising his political and creative journey, giving insight into his personality, passion and humour in an illuminating and insightful way. Attempting to cover such an extensive body of work as Mapfumo’s recordings proved to be an arduous task, but Eyre was cleverly able to assemble a comprehensive and chronological sampling of Mapfumo’s career from his early recordings in 1973 with the Hallelujah Chicken Run, through his 2010 output with the legendary Blacks Unlimited ensemble—founded in 1978—with which he is most recognized. For James Nadal's full review, click here. Tracks 1, 4, 7, 10, 13, 15, 18, 20, and 22 are all excerpts from interviews with Thomas Mapfumo. All were recorded by Banning Eyre, some for public radio’s Afropop Worldwide, some in Zimbabwe and some in the U.S., between 1988 and 2009. Mapfumo’s speaking voice is a thing of wonder, and communicates a lot about his nature and personality. More importantly, in these clips, you can hear in Mapfumo’s words the evolution in his thinking as a bandleader and a social critic. “Ngoma Yarira (The Drums are Sounding)” Mapfumo’s first adaptation of a traditional Shona mbira song. This 1974 track by The Hallelujah Chicken Run Band launched a central initiative in Mapfumo’s artistic career. His is the quieter, answering voice. The song’s lyrics suggest that war is coming to Zimbabwe, which indeed it was. Mapfumo created this song with lead guitarist Joshua Dube, and the original single was credited to both of them. This 1977 hit from Mapfumo with the Acid Band talks back to then Prime Minister Ian Smith, who had recently proclaimed that the country would not see black majority rule “in a-thousand years.” He had to backtrack on that and accept the inevitable within mere months. Mapfumo re-recorded this song in 1999 for the album Manhungetunge. The original master tape of the 1977 single has been lost and it has appeared on no other compilation. Thanks to Samy Ben Redjeb of Analog Africa for providing this version, straight off the vinyl! One of the legendary “chimurenga single,” this brooding adaptation of an mbira song is a classic, and a song that Mapfumo has continued to perform over the years. This is also from the Acid Band in 1977, and it expresses the suffering of people on the land during the liberation struggle. They were deprived of basic goods, terrorized by both sides in the war, and generally made powerless victims. This song tugged hard at the hearts of their relatives in the city. 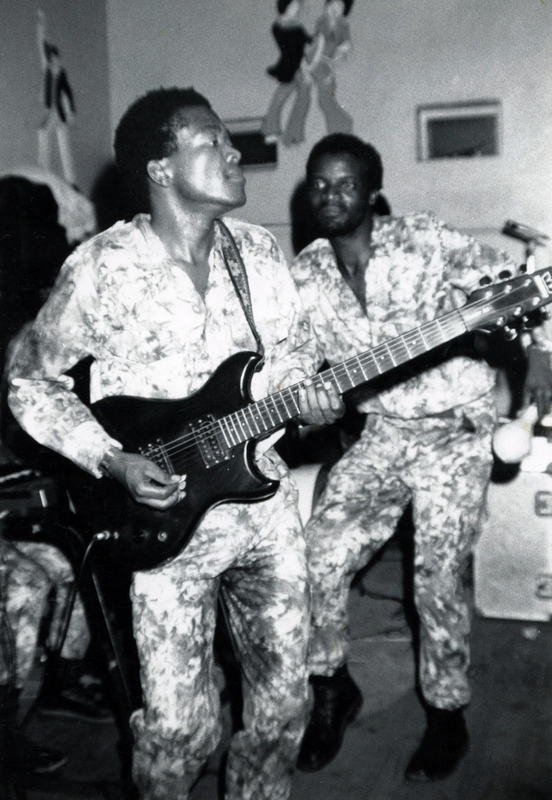 The lead guitar on this and “Pamuromo Chete” is played by Leonard “Picket” Chiyangwa. Soon after their formation in 1978, the Blacks Unlimited created this version of an older song that refers to the uniformly sized boots mine workers were forced to wear while working. Mapfumo’s boisterous performance, complete with whistling and brisk guitar work from Jonah Sithole, made this a big hit for his new band. In fact, it became so well loved that Archbishop Abel Muzorewa adapted the song as a theme for his ill-fated political campaign in 1979. 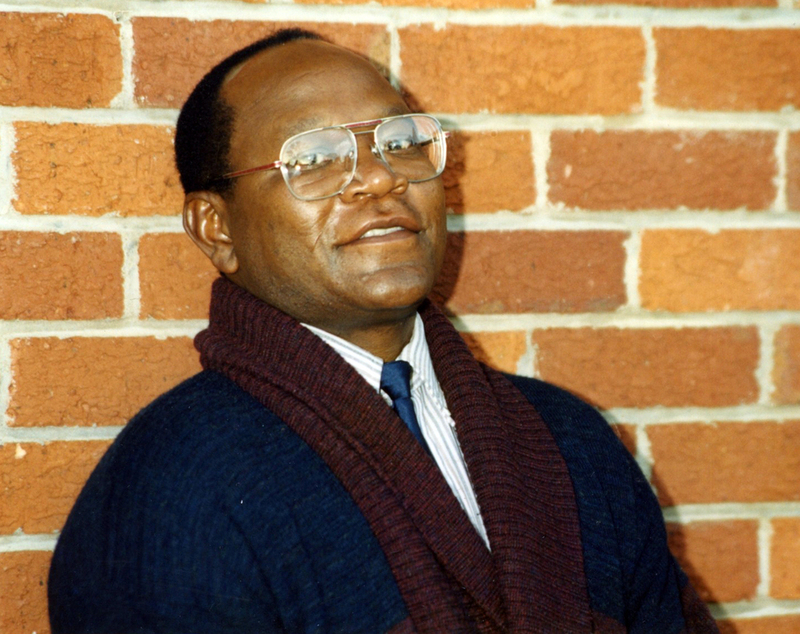 Muzorewa won that election, but could not rule the country and was soon out of politics. Mapfumo’s association with that misadventure took some time to overcome. But the song lives on, still performed by Mapfumo today. This 1981 mbira adaptation is a fine example of the mbira guitar sound that was becoming a staple in the Blacks Unlimited repertoire. The guitarists here are Jonah Sithole and Leonard “Picket” Chiyangwa, picking at their furious best. The lion stands for the spiritually guided guerilla fighters who won the liberation war. A celebratory 1980 song sung at the end of the liberation war noting a return to peaceful life in the war-ravaged countryside. The final moments of the song mark include a name check for Zimbabwe’s new president, Robert Mugabe—a rarity for any politician in the Mapfumo cannon. This 1983 adaptation of a hunting song builds on the metaphor of “snakes in the forest” to suggest that the recently ended war has left dangerous forces behind, “dissidents” intent on reviving conflict rather than moving ahead with peaceful nation building. This also happens to be one of Mapfumo’s most resonant dance songs. Joshua Dube and Emmanuel Jera deliver the tangling guitars, with Washington Kavhai on bass in this new formation of the Blacks Unlimited. This moody mbira composition, created by Mapfumo and his musicians in 1993, with Bezil Makombe and Chartwell Dutiro now on mbiras, and Ephraim Karimaura on lead guitar. The song asks what Zimbabweans will leave to their children and descendants now that they have abandoned so many of their traditional beliefs and practices. This fundamental message in Mapfumo’s work has rarely been so soulfully expressed as it is here. This 1989 song (the CD jacket has a typo; it incorrectly says 1987) changed everything for Mapfumo. Composed and recorded in the wake of the Willowgate scandal, in which government ministers were found to be selling BMWs on the black market, the song pointed a sternly accusing finger at Mugabe’s regime. This was a first, and the start of Mapfumo’s public shift to become a vocal critic of the government he had once helped to empower. This is a live recording made by Afropop Worldwide at SOB’s in New York City in 1991. The song is a warning to young Zimbabweans not to be ensnared in the violent projects of manipulative politicians. 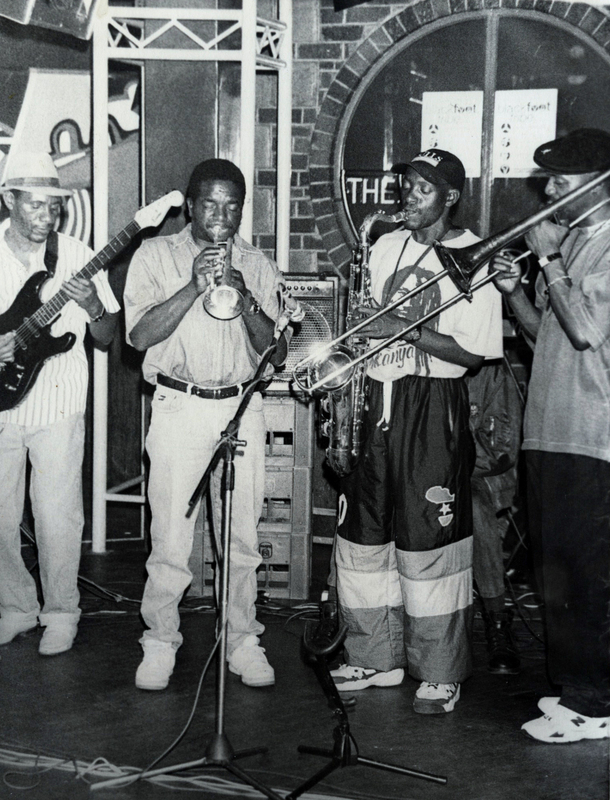 The recording, featuring The Blacks Unlimited brass section, showcases the band’s unique live sound during this era. This adaptation of a classic Shona mbira song is well suited to both hunting war scenarios, wherein early rising is key. It is also a stellar example of the rich sound Mapfumo’s early-90s band created with mbira songs. A real gem! 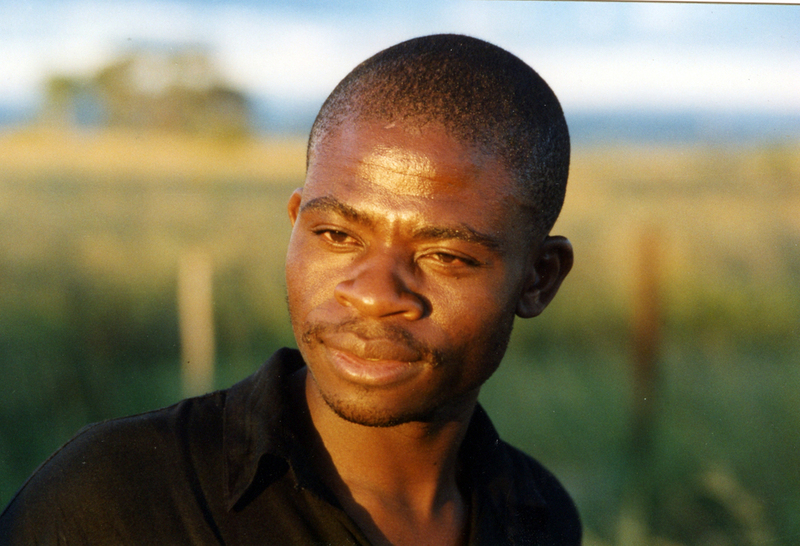 This song was created in collaboration with the author, Banning Eyre, in Harare in 1998. It draws on a West African traditional song, the Mande classic “Kulanjan,” but Mapfumo and his musicians transform it into a powerful lament about the dissolution of Zimbabwe under the Mugabe regime. “Marima Nzara (You Have Harvested Hunger)” This 2001 song, recorded in Eugene, Oregon, with Zivai Guveya on lead guitar, deeply inflamed loyalists to Mugabe’s ZANU-PF party. The song suggests that the government’s thuggish occupation of white-owned farms in Zimbabwe, and general lack of knowledge about agriculture and farming, were inflicting hunger on the people of Zimbabwe. Reaction to songs like this had already caused Mapfumo to move his family to the United States. Soon, he would not be able to return to Zimbabwe at all. This richly layered anthem was the lead track on Mapfumo’s 2010 release, Exile. It expresses the sadness Mapfumo feels at being separated from the land and people he loves. It also demonstrates Mapfumo’s more ambitious approach to studio recording during his years in exile. Much time was taken in creating, arranging and mixing this track. For all that is going on within it (including rhythm guitar by Banning Eyre, and multiple leads by Gilbert Zvamaida), you can hear every detail.